Nestled in Riverside County and nearly equidistant from Los Angeles and San Diego, the city of Menifee, California, continues to attract residents with its excellent location, beautiful nature, and growing sense of tradition. Officially incorporated as a city since October 2008, and including Sun City, Quail Valley, and parts of Romoland, Menifee is quickly growing as increasing numbers of people recognize its charm. Additionally, new construction in Menifee has helped to attract attention from its Southern California neighbors, and affordable Menifee homes provide excellent opportunities to take advantage of all that Southern California life has to offer without breaking your budget. In recent years, this gorgeous city has experienced quick population growth as people begin to realize the wonderful opportunities that come with living in here. If you enjoy nature, Menifee is the city for you. With 28 parks within the city, there will always be something new to discover. Canyon Lake is situated on the western border of the city, and it’s a beautiful spot to relax. A weekly farmer’s market also takes place in this splendid community. At the market, you can find local honey, hummus, and other tasty and healthy foods. The market is also an excellent social gathering; you will see countless friendly faces, and you’ll quickly make friends to accompany you on mini road trips to Los Angeles and San Diego. Less than two hours away, these dynamic cities will simultaneously invigorate you and remind you to appreciate your peaceful life in Menifee. If you’d like to take a quick day trip, Temecula’s picturesque wineries and enthralling Old Town are just over twenty minutes away. Of course, you can also stay in Menifee and enjoy some of the remarkable green spaces in the aforementioned 28 parks. With an average of over 260 days of sunshine per year, spending time outdoors is practically a requirement. Although the city’s popularity is quickly growing, affordable homes in Menifee are still available and come in a myriad of sizes and architectural styles. Envision yourself in a beautifully landscaped single-family Menifee home with a palm tree or two in the front yard. Or perhaps a stylish Menifee mobile home or condo is more aligned with your interests. Regardless of your preferences, the right fit is waiting for you in wonderful Menifee. 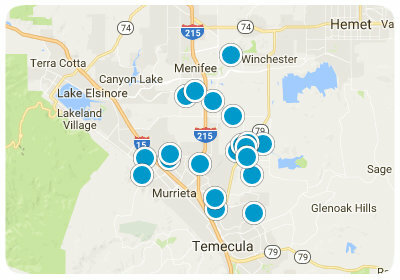 Please do not hesitate to contact us for more information about Menifee, California, real estate!